I read an interesting article recently about beating the winter blues. I was then reminded the next day, when a boost of sunshine elevated my spirits in a noticeable way, that “winter blues” is a catch phrase for a spectrum of mood related changes that affect many of us in winter months. As a naturopath, I work with patients to physiologically support their neuroendocrine (the complex interplay between our brain and hormones) system. Now as a psychotherapy student under supervision, I look at the social and psychological implications of these mood changes. Both these options would be ideal for someone who is feeling that the quality of their life is being notably impacted by the change of season. For others who may feel “winter blues” to a lesser extent – I have listed a few lifestyle ideas to help increase the pep in your step until our longer days and warmer temperatures fill our spirits once again. Brighten your environment: using a light box / SAD lamp for 30 minutes a day has shown to be highly affected in some studies on SAD ( a clinical diagnosis of seasonally related depressive symptoms). Sit close to Windows and draw open curtains when possible. Eat for Mood: speaking to a naturopath or nutritionist to help support mood through diet can be a great support. Simple carbohydrates like sugar can provide short term boosts but longer term patterns of mood instability. Alternatively increasing proteins and in particular tryptophan and tyrosine containing foods can help boost mood. Exercise: A 2005 study by Harvard university suggests fast walking 35 minutes daily 5 days a week to improve mild to moderate depressive symptoms. Exercising under brighter light may also improve general mental health and social functioning according to a preliminary study on exercise and mental health. Get Outside: Being outside and in nature when possible can help improve focus and lower stress levels. So add a layer and bundle up! Get Involved: Social isolation in cold winter months can add to poor sense of wellbeing. Make social arrangements or find volunteer or charity groups to be involved with as a way to boost spirits and outlook. We know that babies often can’t communicate their needs clearly, and this makes it difficult to assess a new situation or environment. If it’s your baby’s first winter, you might be having a worrisome time deciding how to dress your infant for the cold, wet, windy (and sometimes unpredictable) weather we’ve been having. Many parents’ intuitive move is to bundle, bundle, bundle. This is understandable, since babies are temperature-sensitive and their immune systems are still developing. They also don’t have much hair, making their heads highly exposed to the elements. We must remember however, that overheating is a real risk for young, sensitive babies, whether it’s in the car seat, stroller or crib. 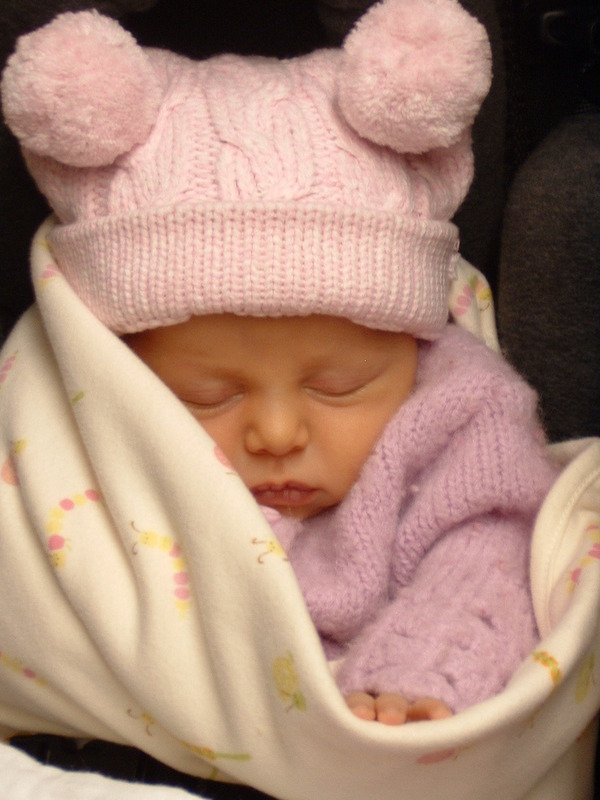 You’re right to keep your baby warm and dry, and to take special care to protect infant hands, feet, faces and heads. Make sure that your baby’s ears are covered to avoid the risk of an ear infection. Always cover hands and feet properly, but don’t necessarily use these as an indication of your baby’s temperature. Babies’ have different circulatory systems than adults, so testing their fingers or toes to the touch isn’t always an accurate way to tell if your child is feeling chilly. While you should take your baby’s warmth seriously, you should also be mindful of overheating. Watch for signs that your baby or toddler is uncomfortable. He or she might tug at blankets and clothing, squirm and display reddened skin. Layering is a smart way to prepare for uncertain temperatures. This way, if you notice your baby overheating, you can easily remove a blanket or sweater. This is especially prudent if you’re on the go, and transitioning your baby between indoor and outdoor temperatures. Be careful when swaddling as well. In the car, this can trap heat and raise your baby’s internal temperature. If you notice your baby fussing in the car and showing a flushed face, check that you haven’t overdressed or over wrapped. Remember that you can always add layers before taking your child out of the car. Lastly, in wet, wintery weather it’s important to not only dress for warmth, but to keep your baby dry. Choose water-resistant fabrics when buying snowsuits, coats, mitts, and stroller covers. Remove damp clothes immediately when you come into the house –this means both you and baby. One of the most important factors for ensuring your baby is well taken care of is keeping YOU, the caregiver, healthy too! So always take a moment before you walk out the door to ensure that you’ve protected your hands and ears, and are dressed suitably. Wishing you and your little ones health through the rest of winter!